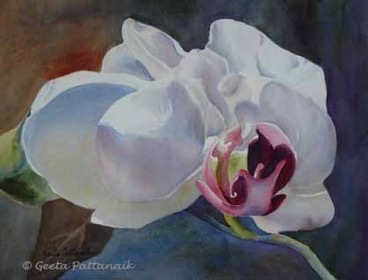 Here are two photos of a painting of an orchid, which I did for a class. I cropped the reference photo, which I had taken, to keep the task simple, but elegant, for the class. I also wanted it to be a challenge for the students. The first photo is about one-third of the way to completion and the second is on completion. I wanted to show the students, how to depict whites in a painting. I did an underpainting with blues, pale pinks and yellows, and then built on that to bring out the shadows on the petals. I left the background simple but darker, so that the flower would stand out. 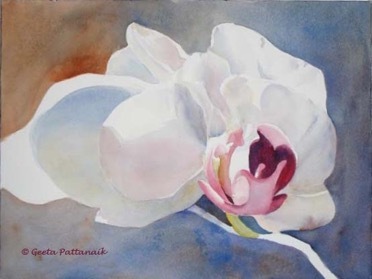 The direction of the light is from above and I wanted the whites of the paper left in its original state, to show the brightest spots in the painting, which included a few spots in the red/pink area of the flower. This area is the focus of the painting, and also has the darkest areas. Some of the whitest spots are nearest some of the darkest spots. I also wanted to depict reflected light by showing how some areas depict the reflected light from some of the nearby areas. In class we discuss the lights and the different types of shadows, so this was a good example to follow through to the end. Another task was to show the three dimensional quality in a subtle way, with values and colors, without a trace of grey or black. I quite liked the way this painting turned out finally.